The meat of sharks, according to those who eat it, it seems simultaneously to the fish, scallops, chicken, and pork chops. Sharks have a cartilaginous skeleton, therefore, neither the chef nor the consumer do not need to worry about fish bones. To prepare toothy predator just, her meat needs minimal pre-processing and having low-fat, easy to absorb different flavors from seasonings and marinades. Buy shark meat, or in hypermarkets, or from trusted suppliers. Sharks withdraw urine through the skin, so if the fish is not cleaned immediately after catching, the smell is not to get rid of. 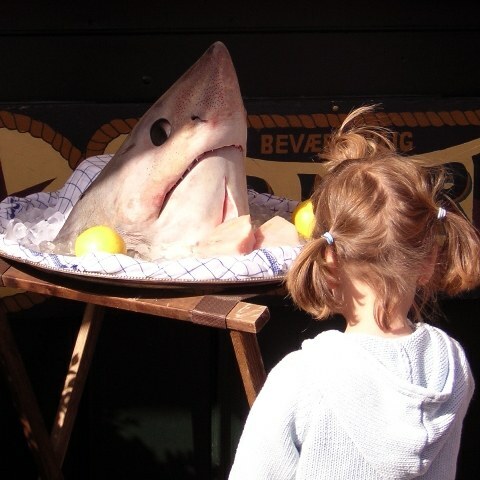 If, despite all precautions, a light smell of ammonia is still there, soak the shark in brine or milk. This should take 20 to 30 minutes. Cut off all dark meat – it can give an unpleasant taste. Cook the shark steaks on the grill. If you've ever prepared so salmon, believe me – there is almost no difference, except that shark meat is lean. Marinate shark steaks. You can use any marinade of vegetable oil, acid and spices. Shark meat goes well with lemon juice, white wine, rice vinegar. Leave the meat to marinate for 1-2 hours. If you don't have the time or desire to marinate the shark passiruyte it in for 3-4 minutes in hot milk, wine, broth or just water with different herbs. It will also help it soak up the flavors and will make a juicier and softer.Grill heated to medium temperature at the rate of 10 minutes for each inch of thickness of steak. Make shark kebabs. Cut the meat into pieces, marinade and thread on skewer, alternating with cherry tomatoes, slices of sweet bell pepper, diced pineapple or other vegetables that you used to cook the fish skewers. Bake over the coals as standard skewers of salmon. Just fry the shark steaks in the pan. Rinse the meat under running water, blot with paper towels, and repel with a special hammer, RUB them with spices and salt. In a pan heat the vegetable oil, for example olive or peanut, and fry first with one and then the other side until Golden brown, based on the same calculations at the time when cooking on the grill. Remove shark meat from the pan and place on a plate. Degenerate pan Gulf ¼ Cup white wine or broth, boil the sauce for 3-5 minutes. Serve the shark steaks under the resulting sauce.